When I got my Holiday Bonus from work this year, most of it went towards presents. I did manage to set aside just a little bit for myself, and I used it to expand my Gameboy library. I didn’t get my hands on a Gameboy until the Gameboy color series was already out, so I missed out on a lot of the early titles. I got a few classics like Tetris, Mario Land, and Kirby, but there was one game that caught my eye and I just had to buy it. That game was Penguin Wars. I had never heard of this game before, and I’m not really sure what it was that made me want to buy it so badly, but it went straight into the cart. When I got them home, it was the first game I tested, and I felt like a little kid again. Just that pure joy of putting in a game, not knowing what to expect, and having it be just a pleasure to play. But I’m getting ahead of myself, let’s take a look at what made the game so much fun. Despite being called “penguin wars”, you can actually chose to play as any of the 5 different animals. There’s a Penguin, a Bat, a Rabbit, a Rat, and a Cow, each of which have their own strengths and weaknesses. The Cow for example moves the slowest, but throws the hardest, whereas the Rat moves the fastest but throws really slow. As for the gameplay, it’s very similar to dodge ball. Each match is played “best of three games” to decide the winner, with each game having a 60 second time limit. You each start off on opposite ends of a table with 5 balls each, with the ultimate goal being to send all 10 balls over to your opponents side of the table. If no one wins within the time limit, whoever has the fewest balls on their side wins. Like I said before, the game is basically dodge ball. Hitting your opponent will stun then temporarily, giving you the time you need to send all the balls over to their side. But watch out, because if you get hit, you’ll go down too. The AI is also very relentless and won’t let you back up once they knock you down. Of course the best and easiest defense is to simply dodge the balls as they come, but you can also throw your own ball into theirs to deflect it. The physics were actually pretty good in this game, sending the balls bouncing around the table when they collided. If the match starts to run long, around the 20 second mark an obstacle will appear in the center of the table. These can range from a “slime monster” which bounces the ball back at you, or a spinning disk which sends the ball flying in a random direction. Sometimes it’ll even be a…God only knows. Given my choices from the manual, my best guess says this is the “Crazy Dog”, but that’s no dog I’ve ever seen. To me, it looks like some little guy with a ponytail, and every time you hit him he chugs a drink. It’s weird, but oddly cute at the same time. Speaking of oddly cute, I have to point out the match against the Rat. The poor little guy is so short he can’t even throw the balls. Then when you hit him, he falls over screaming for help and trying to quit. You just can’t help but feel bad for him a little. After you beat all 4 of the other animals, you’ll be crowned the winner of the tournament. How did the Rat take 3rd place? He couldn’t even throw the ball. I guess it doesn’t matter, because the fun isn’t over just yet. After your moments on the victory stand, the whole thing starts over again, this time with the other animals powered up. You’ll have to be extra careful this time around, because they’ll be rocketing over “Power Balls” every chance they get. You can give them a taste of their own medicine by powering up your own shots as well, but the charge up leaves you more vulnerable, so use it at your own risk. Either way, let the war continue as long as you can hold out! The gameplay is incredibly simple to pick up, using only the direction keys and a single button for every action. But the fun is in the simplicity. Anyone can pick up the game and right away figure out how to play. My only complaint comes from how brutal the AI can be after knocking you down. Often if you fall down, you stay down. While the graphics are limited, what is presented is very well done. All the characters are cute and very likeable. 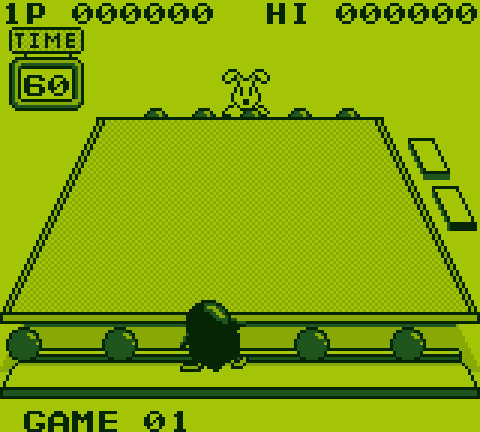 Then the pseudo 3D effect of the balls as they roll across the table is very impressive for the Gameboy. The music is actually very nice in the game, there just aren’t a lot of different songs. That’s not why it gets such a low score though. When the game first boots up, the logo sound is a loud, sustained, single note screech that nearly made me go deaf. While this isn’t really a part of the game proper, it’s still your very first impression of the game, and it’s not a pleasant one. A bunch of animals got together and wanted to play dodge ball. You got a problem with that? I didn’t think so. It’s a really short game. I actually managed 2 full tournaments in that time frame. But that’s typical of many Gameboy games, especially these types of games. It’s only meant to be played in short bursts, and that’s fine. I made it to the final match of the 2nd tournament. I don’t think that’s too bad. I can probably make it farther if I played more. This is one of those games you can happily come back to again and again. The gameplay is simple, but has just enough challenge to keep you on your toes. With its combination of cute characters, catchy music, and tight controls, it’s hard to find any real fault with this game. Also, I found my copy for just $5, so there’s no reason you shouldn’t add this game to your collection. I hope you enjoyed Penguin Wars. If you did, like and follow me on Facebook or Twitter. Also leave your comments, suggestions, and recommendations. If you’re feeling real generous, you can even Donate to help me keep the site going. Thank you for reading, and I’ll see you next time.